MATLAB R2014b and later are fully supported on Mac OS X 10.10 (Yosemite) and 10.11 (El Capitan). We recommend you update to R2014b or later if you are using OS X 10.10 or later. "You can't use this version of the application". MATLAB releases R2008b through R2010b should work on Mac OS X without a patch. However you will need to install <https://support.apple.com/kb/DL1572?locale=en_US Legacy Java 6> and XQuartz to run these releases on 10.10 or 10.11. To our knowledge, MATLAB R2008a and earlier will not run on Mac OS X 10.10 and 10.11. You may be able to get this configuration to work with by installing Legacy Java 6 and XQuartz, but generally these releases will not run on these operating systems. Bruh... you gotta check that stuff before upgrading haha. Maybe they will be generous, but its not their responsibility really.. Using matlab_R2012b on a MacBook Pro recently upgraded to OS X 10.10, there are more issues than just the patch described in Point 1 above. Firstly, after applying the patch (which went smoothly), Matlab then complains that it needs a Legacy java installation. After installing that legacy Java installation, it then generates a License Manager Error -9, as the Host id of the computer seems to have changed with the OS upgrade. If someone from MathWorks could provide guidance, that would be great. It works! (R2013a_Student with Jave 8u25) It may have been a while in coming since the betas, but I'm glad to have Matlab again. Thanks! After installing Yosemite 10.10, my version of Matlab2014a showed the described issues (i.e. the Java exception), I patched it but this did not solve the problem and now whenever I run Matlab2014a the application quits without any error message. I also downloaded Matlab2014b, but the installer quits without doing anything right after launch. Yes! Mine version is 2013a. It comes back when I finish the patch! Thanks! Does not work for R2012a Student Version..
Lukas, Have you resolved how to get R2012a Student Version working? I am encountering the same issue. The installation of 2014a version on Yosemite fails and it is impossible to patch. For those of you still struggling with getting the R2012a Student Version working, the following steps worked for me. Step 2: Attempt to open Matlab. This will ask you to update your Java Runtime Environment. Download and install the update from the link provided by Apple. It should be this url. After that, you should be good to go. Hope this helps! John Loft's instructions worked for me (Matlab R2012a) on Mac OS X Yosemite. In fact, I got an error message indicating that the X11 library was not found in /usr/X11. After creating the softlink, the problem was resolved. Thanks so much John! Just wanted to add that if you're running R2012a Student, then the post by "John Loft on 6 Nov 2014 at 21:31" solved my problems! Thanks, John! @Fred @sarah @luiz @cristiano @lucas As pointed out by Image Analyst, please feel free to contact MathWorks Technical support team if you are still facing issues with installing MATLAB. My 2012a is still not working. I get the message "You can’t use this version of the application “MATLAB_R2012a_Student” with this version of OS X." I did what John Loft said and I then tried to open matlab again and got the same message. Nothing about X11. Please help someone! one more vote for John Loft's answer. I want to say that if the patch does not help you, do not reply here . The Mathworks does not answer these kind of posts in this forum. If you have trouble after their suggestions, then call them for free telephone support, even for student, education, home, or any other version. Installation help is always free for everybody, so do not post to the answers forum that you still can't get it to work. Just call them. Same error over here. Mathworks.com in an e-mail (from my crashreport) claimed to have solved the issue in 2014B, but unfortunately not. Noticed that in /Library there resides also an older version of the JDK, not sure if that's the origin of my/our problems. I am having the same issue with 2014b. Yosemite is all up to date. Mathworks, please do something. Please contact MathWorks installation support by phone, email, or through your MathWorks account regarding this problem with MATLAB R2014b. The problem is being tracked by MathWorks. I also meet this problem! What should I do? I also have this problem, has anyone found a solution? I'm sure the Mathworks has. Have you called them yet? If not, why not, since telephone support is free for all users? I can't download the patch for 2013a. Can you help me, please?? Thank you very much. It works for 2014a (macOs)! The patch is really helpful, worked for me well. I appreciate for the support you are giving solutions for each and everything bugs. Thank you very much. Do you have any plans to get rid of the Java requirement in your products? I'm not very excited on installing JRE on my Yosemite due to the endless amount of issues it has caused in the past. It's just a bit complicated if the only way I can safely use Matlab is on a Windows virtual machine on Fusion. MATLAB R2013b and newer releases include their own internal version of Java. They do not require you to install Java on your system in order to perform the installation or run MATLAB. I have successfully installed Matlab 2014b, but it keeps asking me to activate it. After I have activated it, it automatically closes, and when I reopen, the same thing happens. I have repeatedly reinstalled, and tried with 2 different licences (from the 2 institutions I am currently affiliated with) but nothing works. Also I have waited 2 days for a response to appeals for help from the Matlab team. I can not open Matlab 2014b Help Window on Mac OS Yosemite. When open any help window of Matlab2014b, it is just hang-on and don't respond, I have to kill the whole Matlab process. The java is MacOS java 1.7. Matlab UI language is Chinese. Matlab r2014b has been written but imported attachment for r2014a. Could you send us for r2014b patch ?? 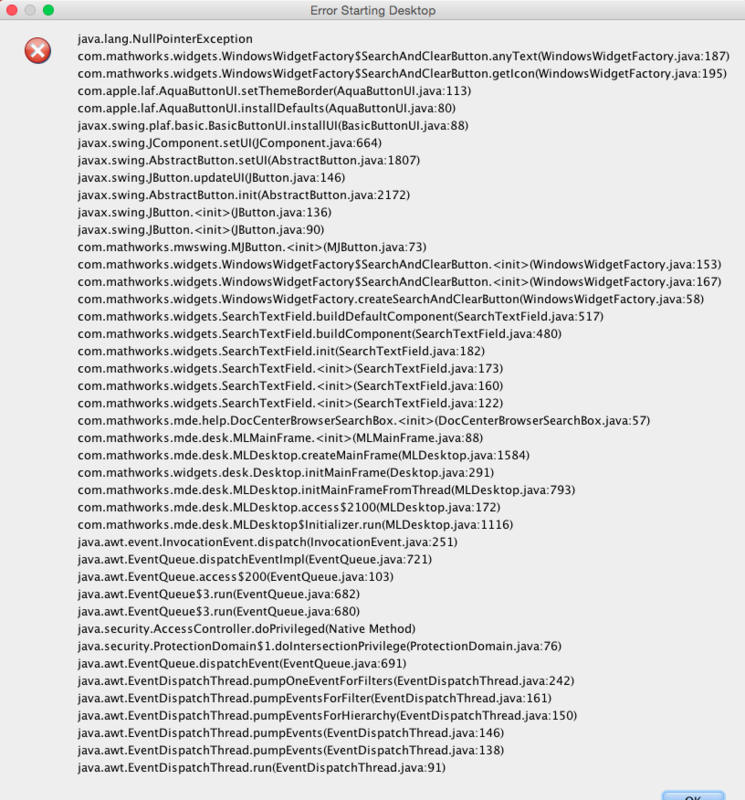 The 1098655 bug is for Java error on startup, not for problems with the help browser. I cannot cancel this process and it has made Matlab unusable. I have tried reinstalling Matlab and I am running the latest version. You can also possibly resolve this issue by closing the Current Folder browser. It will not let me download R2014a on OS X due to it being by an 'unidentified developer', I cannot find any solution to this problem in the install guide PDF doc. i can t download matlab on my macbook pro due to an error 408. can you help me ? Have you got a patch for r2014b ?? Hey I'm trying to patch matlab r2011a student edition on yosemite and it isn't working. I have reinstalled matlab and it still doesn't work. Please contact Mathworks technical support through support@mathworks.com and they will be able to help you further with the issue. I also have tried to fix the same issue by the patch on a matlab r2012a and although the patch installation reported no error, it doesn't work. What could we do ? I have downloaded Matlab 2014b on my Macbook Air (Yosemite). It says: You can't “InstallForMacOSX” because PowerPC applications are no long available. What do I do in this instance? Hi Luca, please contact Mathworks Technical Support with your question. Very Useful, thanks. It works. I was having an issue on Mac OS X 10.11 after installing R2010a. I was getting the error MATLAB can't be opened because of a problem, in order to fix it I right clicked on the .app file (MATLAB_R2010a.SV.app) and selected show package contents. In the following folder there is another .app file called Activate.app. If you open that and activate your copy of MATLAB it should launch fine afterwards (assuming you installed the legacy version of Java and Quartz mentioned on the installer page). I could not install MatLab 2013a on my lap top, macOS Sierra version 10.12.6. Instead, MatLAB 2014b was installed and it works well. Thank you so much.